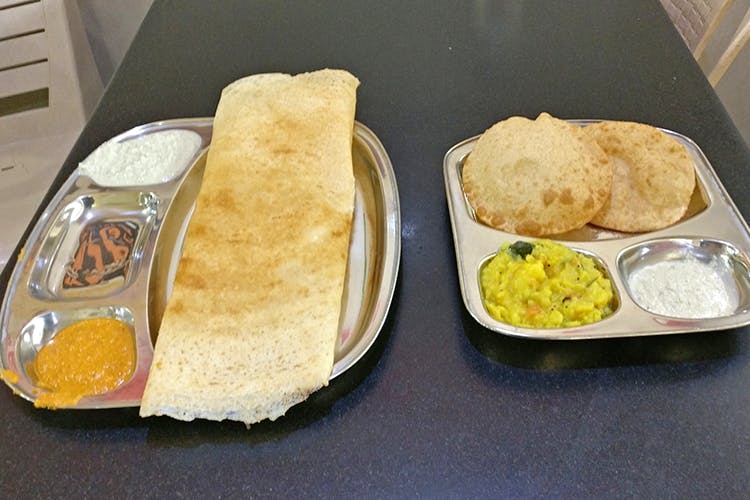 Quick, cheap and tasty South Indian breakfast food is what this age-old vegetarian restaurant in Besant Nagar is known for. Say hello to Vishranthi Bhavan. Started almost two decades ago, this South Indian restaurant is known for its breakfast food. Situated on the notable 2nd Avenue in Besant Nagar, it’s hard to miss as you’re passing by. There are standing tables and a small section reserved for seating which is perfect because most customers are in and out pretty quick. Speaking of customers, Vishranthi is most crowded in the mornings, and with a 6am start time, you’ll find plenty of regular patrons stopping by for their morning (filter) coffee and dosa. The most popular dishes are ones we all know and love; dosas, masala dosas, pooris, uthapams, pongal, vadais and the remaining family of South Indian breakfast food. As with all small eateries, dishes are made to order, but the curries and chutneys are made at the start of the day. Taste wise, none of the dishes are too oily and the chutneys aren’t watered down; all in all, everything tastes just like it would at home and that’s why we love Vishranthi. Having been regular customers here for years now, we must mention that we’re very partial to the poori and potato combination. Other than breakfast food, for lunch and dinner there’s North Indian food like, naan and pulao, along with other “adventurous” preparations like fried noodles that we wish we could recommend but unfortunately can’t. Their coffee and tea however, are two more things we can. The filter coffee especially is yum. Price wise, you can eat a hearty meal for INR 200 and finish it with a nice coffee. Vishranthi is the kind of place you go to when your cook isn’t coming and you want something quick and tasty that won’t break the bank. Go on, and wake up early for this!